, this includes basic mobile management that’s on by default. Keep reading for more information on this new setting configuration and how it’ll be rolled out to your organization. If your users bring their Android and iOS devices to work, you have the option to turn on mobile device management for additional security. If you’ve never enabled this option, we will automatically turn on basic mobile management for your domain by the end of the year. This means that any user who doesn’t currently have a passcode or screen lock on their device will be required to set one up before accessing their G Suite apps. Turn on basic mobile management now, and enforce a passcode on your users' devices. Turn on basic mobile management now, but don't enforce a passcode on your users' devices. 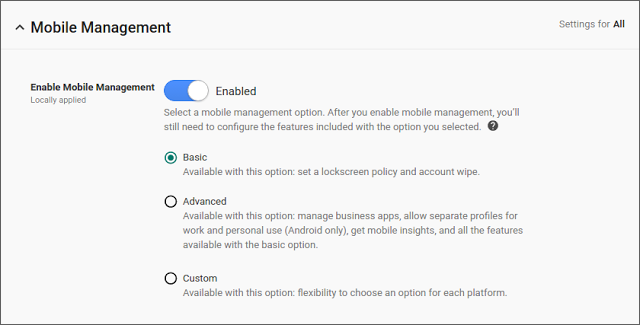 Enable and then disable mobile management. This will prevent basic mobile management from being turned on automatically. If you do any of the above, passcodes and screen locks will not be automatically enforced at any point in the future. If your organization has previously enabled basic, advanced, or custom mobile management, your users won’t be impacted by this launch. For more information on Google Mobile Management, please visit the Help Center. We recently introduced several features for G Suite to help keep your data secure. As described in our earlier post, this includes basic mobile management that’s on by default. Keep reading for more information on this new setting configuration and how it’ll be rolled out to your organization.